With over 2.27 billion monthly active users, Facebook is one of the world’s leading brands and social networks. Beyond simply displaying the social media icon linking to your Facebook page on your website, there are plenty of other ways to integrate your business’ Facebook profile with your WordPress website. One such option is to display a feed of your Facebook posts on your site. 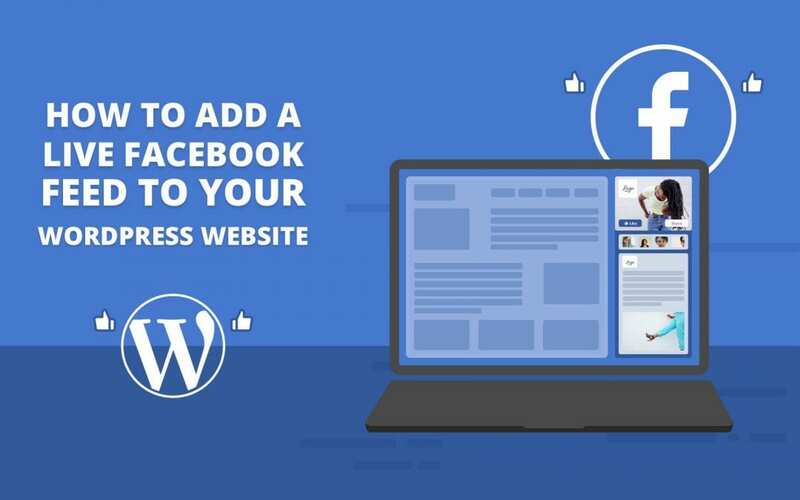 In the following post, we’ll show you how you can integrate your Facebook account with your WordPress website in order to display a Facebook feed on your site. Not only will this increase engagement but it’ll have a positive effect on your site’s user experience too. As always, we recommend testing out new code on a development site or testing environment before working directly on your live site. For this tutorial, I’m using the Divi All Purpose child theme. Divi All Purpose is a free child theme for Divi that can be downloaded for free from the Aspen Grove Studios store. Download Divi All Purpose today and start building a standout Divi website with Divi All Purpose. There are a number of ways that you can add a Facebook feed to your WordPress website. Facebook for Developers offers an array of social plugins, designed to help maximize the display of your Facebook page on your website. 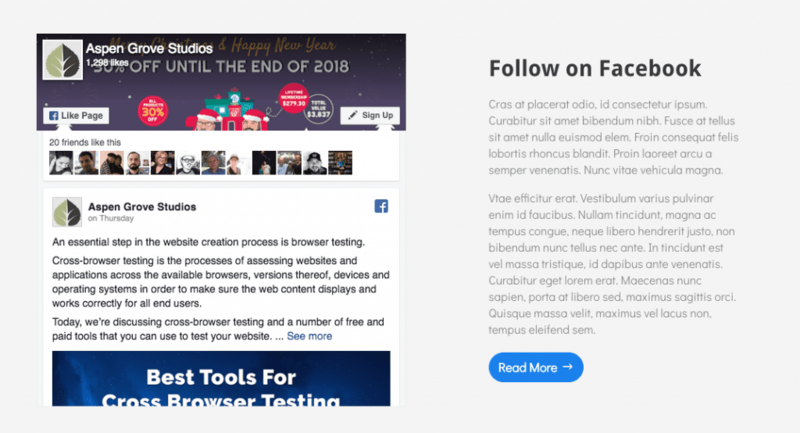 As well as being able to embed a comments stream, display a Facebook group on your site and much much more, the Page Plugin also offer an easy solution for embedding a feed into your site. To begin, visit the Page Plugin page. Here, specify the variables that you’d like the feed to include. Facebook Page URL: Enter the URL of the Facebook feed you’d like to share. Tabs: Here you can decide whether you’d like to include a feed of the timeline, events or messages. To display one of the three options, simply write ‘timeline’, ‘events’ or ‘messages’, to display all three in multiple tabs, use a comma-separated list. Width and Height: Here you can set the custom dimensions, within the maximum size parameters specified. Other options: Finally you can choose whether you’d like to display a slim view of the header, remove the cover photo completely, allow the plugin to adapt to the container and whether you’d like profiles associated with the user to display in the feed. 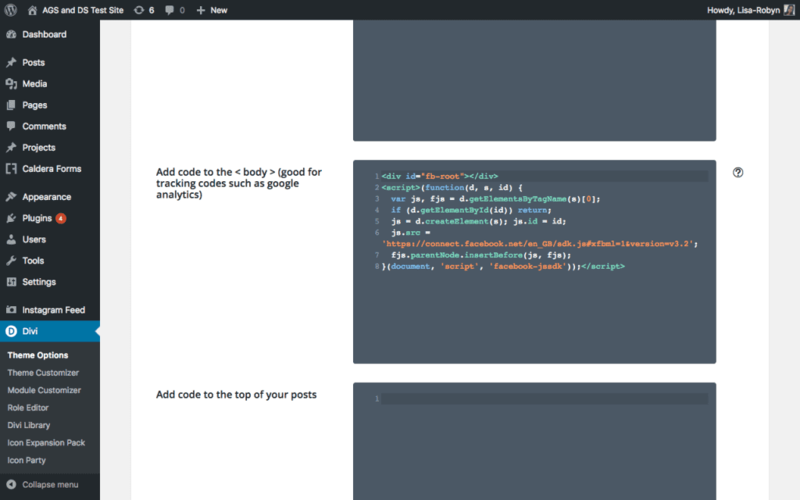 Once you’ve finished setting up the feed display, click Get Code. Now, a pop up will arise with two code snippets. Copy the first code and paste it into the header.php file in your WordPress website child theme, as instructed, below the opening <body> tag. If you’re using the Divi theme by Elegant Themes, you don’t have to worry about touching code in your child theme. 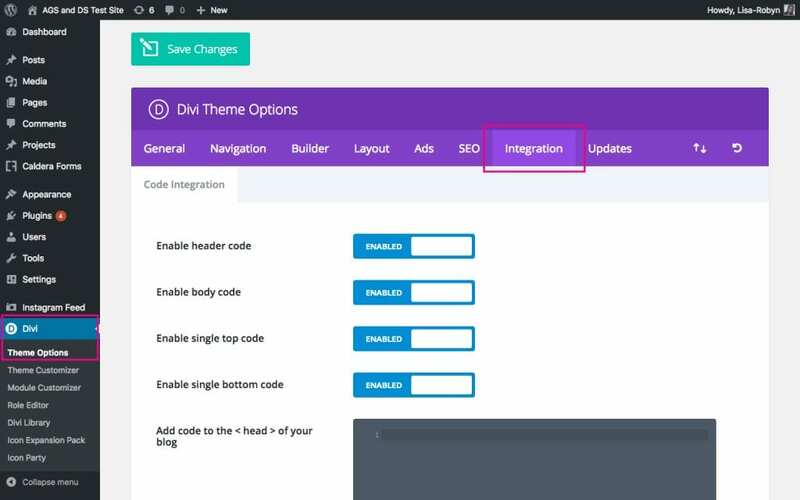 Instead, navigate to the Divi > Theme Options menu and click on the Integration tab. Scroll down until you see the Add code to the < body > (good for tracking codes such as google analytics) textbox. Paste the code here and click Save Changes. If you’re using Divi, you can paste this code into the Code module. The Facebook Page Plugin page offers a few customization options, such as changing the call to action button, changing the display language of the feed, further customizations with tabs, and so on. Another option for the feed display is to add the code into a widget. To do so, navigate to Appearance > Widgets, select the HTML widget and drag it to where you’d like it to be placed, i.e. in the footer or sidebar. Paste the code into the widget text area and click save. Below is an example of the Facebook feed added to the sidebar of the blog. If you’re looking for a simpler solution to using the Facebook Page Plugin option, consider using a free plugin from the WordPress Repository, Custom Facebook Feed. A free plugin with over 1000 five-star ratings, the Custom Facebook Feed plugin from Smash Balloon is a great solution for those looking for a highly customizable feed to display on their site. To begin, install and activate the plugin on your WordPress website. Read our guide to adding a plugin to a WordPress website. Once the plugin is installed it’ll create a new menu item. If you’re wondering, the Instagram Feed plugin located just below the Facebook Feed plugin is also from the same development company, Smash Balloon. As the name suggests, the plugin allows you to add an Instagram feed to your WordPress website with little to no fuss. To begin, go to the Configuration tab and click on the Log in and get my Access Token button. At this point, a pop up will appear that’ll ask you to log into your Facebook account. At the Facebook authentication page, a list of the pages you manage will pop up. Select the relevant page from the list and click Ok.
Next, enter your Facebook ID. If the URL of your Facebook page looks this – https://www.facebook.com/your_page_name – then the your_page_name text is your Facebook ID. If the URL of your Facebook page looks this – http://www.facebook.com/your_page_name-1234567890 – then the 1234567890 text is your Facebook ID. Once you’ve requested the Access Token, a key will automatically be entered into the Facebook Access Token section. Once the account has been fully authenticated, there are a few extra settings that you can set to your liking. To add the Facebook feed to your site, copy the shortcode [custom-facebook-feed] and paste it anywhere on your website. To customize the appearance of the Facebook feed, click on the Customize tab in the plugin settings. There are countless customization settings, split into various tabs. Within each tab, you’ll find a number of customization options. With so many styling options, you can create a truly unique Facebook feed that suits your brand identity and website’s aesthetics. If you’d like feed that mimics the visual style of the Facebook feed, then the Facebook Page Plugin option may be a better choice for you, however, if you want to create a Facebook feed for your site that really matches with your website’s look and feel, then the Custom Facebook Feed post may be a better option. Have you incorporated a Facebook feed into your WordPress website? If so, did you use one of the above-mentioned options or a different solution altogether? Let us know your experience of integrating a Facebook feed with your website.